Attorney Jerilyn Jacobs Joins Weld Riley, S.C. The law firm of Weld Riley, S.C. is pleased to announce Attorney Jerilyn Jacobs has joined the firm as a shareholder. Prior to joining Weld Riley, S.C., Jerilyn practiced in the Milwaukee area for almost two decades. She specializes in litigation on behalf of employers in employment and labor-related matters, including claims of discrimination, harassment, wrongful termination, non-competition, and violations of collective bargaining agreements. 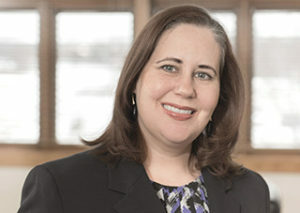 She defends employers before the Wisconsin Department of Workforce Development, the Equal Employment Opportunity Commission, in Wisconsin state court, and in federal courts in multiple jurisdictions within the Seventh Circuit. She also defends plan administrators, insurers, and employers in ERISA federal court litigation.